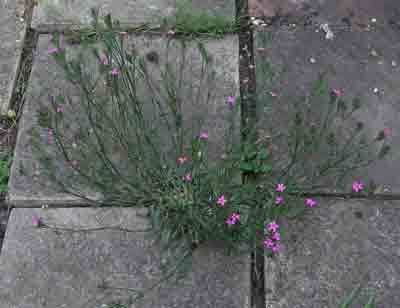 Deptford Pink (Dianthus Armeria) plants at Hadleigh Castle. Update 4 July 2014: No plants seen at all within Hadleigh Castle grounds. 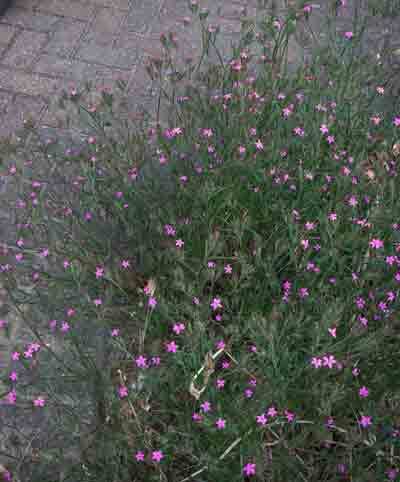 One plant seen nearby in May 2013. So here are a couple of pictures of successfully grown plants which will hopefully produce several thousand seeds for redistribution on slopes near the castle site. Single plant grown all by itself. 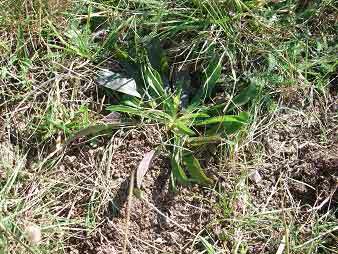 Multiple plants, self seeded in light soil. The seeds seem to germinate best if the seed is in a crack between paving stones, alongside a stone or against the side surface of a pot. The plants grow best from seed sown in the intended place. This is due to a very fine, very long and massive root system which immediately becomes pot bound unless sown in a very large pot. 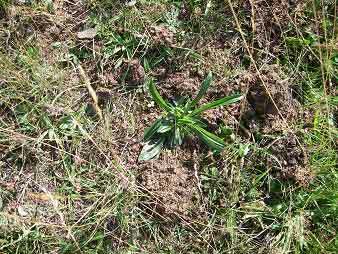 First year growth of the this biennial plant. These leaves which originate in the middle are quite different from the tall second year flowering shoots. First year growth of the this biennial plant. Sometimes, over winter, these leaves become purple tinged. It is no problem. They get going well in the spring before the shoots grow and flower. The Hadleigh Castle site is looked after by the Salvation Army who have a training centre and farm and sell teas and coffee and lunches nearby. They are pleased to help sustain this rare plant in one of its long known habitats. There is a massive re-seeding project under way all along the escarpment all the way from Hadleigh Castle to Southend Pier. The area just above Leigh station is a nature reserve but the tough scrub makes it difficult. What is needed is disrupted ground like the graded slope where the old Alexandra Yacht club once stood and elsewhere where there have been excavations and earth works. Any comments please e-mail Eric Johnston.